Picked in the early hours of October 13, 2016 at 23.2° Brix and a pH of 3.31. The yield was about 1.2 tons per acre. After sorting, this wine was destemmed allowed to ferment on native yeasts. We pressed the wine into neutral French oak barrels for ten months and bottled the wine in late August 2017. The finishing pH is 3.42 with a TA of 6.2. Dusty boysenberries, cassis, bergamot and dried kelp aromas. A rich texture with a persistent core of wet granite and iron minerality. Lively red raspberry, dried cranberry and Santa Rosa plum on the palate with a smooth yet gripping mouthfeel. A balanced tannin structure flows long into the finish. Picked on October 1, 2016 at 24.2° Brix and a pH of 3.68. The yield was a little over two tons per acre. Sorted and gently destemmed, with about 10% stem inclusion. After four weeks on the skins we pressed this into two neutral French oak barrels on October 29, 2016. After eleven months in barrel, we bottled 53 cases in early September, 2017. The finishing pH is 3.74 with a TA of 5.5. From the only Syrah vineyard in Anderson Valley. Black cherry, pomegranate, leathery and cured salami aromas. 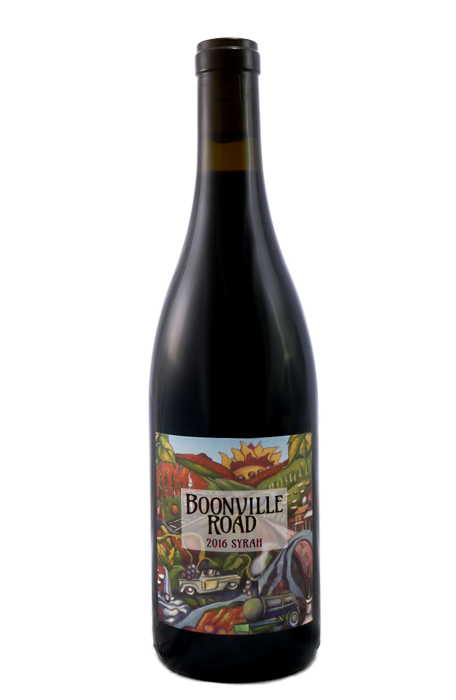 A core of flinty graphite umami supports layers of marionberry compote, sautéed chanterelles and black trumpet mushrooms and a medium tone, with silky tannins enhancing the finish. Casa Verde was planted in 1942 on Redwood Valley bench land near the headwaters of the Russian River. The alluvial soil here is Yokayo Series, well-drained soil studded with green and red river rocks. Peter Chevalier farms these 75+ year old, head pruned, dry farmed vines traditionally with cross cultivation. The vineyard is a field blend of mostly Carignan with some Grenache and a thread of French Colombard woven in. Low yields produce medium bodied yet intense wines with great acidity and minerality. Owner Steve Williams broke his leg on the steep slopes of this vineyard as it was being planted in the 1980s, giving the site its name. The vineyard sits in a bowl almost up to the top of the coastal ridge in the Deep End of the Anderson Valley. The vineyard is as steep as Côte-Rôtie and climatically similar as well, although the surrounding redwoods give the vineyard a unique look. Planted to the Shiraz and Durrell clones, this is some of the northernmost Syrah in California. The grapes from these thirty year old wines produce agile yet intense Syrahs with a brambly, savory character. A unique site, Alder Springs is 140 acres of steep vineyards planted between 1700 and 2700 feet west of Laytonville in northern Mendocino County. Warm days, cool nights, and low vigor sandstone soils result in a long growing season and vines that reach deep, yielding wines with great minerality. In 2017 we sourced Syrah, Mourvèdre, and Counoise from Alder Springs. Sign up for first access to new releases, events, and other news.